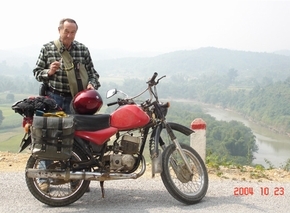 My thanks to Explore Indochina for another great ride on the Iron Buffalo...the well-earned nickname of the Belarusian Minsk motorcycle. I took the 8-day tour of NW Vietnam last February, and so thoroughly enjoyed it that I returned in October to explore the NE of Vietnam on the 7-day tour. As in February, I was impressed with the vistas presented and the program as planned and coordinated by Explore Indochina. The variety of scenery, lodging and roadways never failed to maintain my complete interest and attention. I never suffered a moment of boredom and looked forward to each day. As I live on the small island of Oahu in the State of Hawaii, I am limited on the routes I can travel without repetition. There aren't many streets or highways that I haven't been on many times over. Naturally, this situation only added to my enjoyment of exploring the NW and NE of Vietnam. I must admit that since I consider myself a "cruiser-type" rider, at times I found the "dirt-bike" rider aspects of the NE quite challenging. As in the NW, the NE seemed to have either road deterioration or road repair and construction efforts underway in many, many stretches throughout the area. The large rocks, gravel, dirt, ruts and potholes that can suddenly appear around any bend didn't allow my mind to wander or wonder what a cold Tiger would taste like at the moment. The day spent on the boat navigating Ba Be Lake and River was relaxing and a pleasant change from the rigors of the road. After the day of rest, we mounted up for the 200-km ride back to Hanoi and with regrets I returned the Minsk to Cuong, the master mechanic. Again, thanks guys, for another great adventure.